From Aaron Ansuini (@AaronLinguini). Click to embiggen. I found a meme some time ago of the text from the tweet pictured here, but just white text on black and no attribution. It been sitting in my “For Blog Posts” folder for a while. Because this weekend I kept getting more twinges in various joints than usual, I kept thinking about it and that maybe I should do a post about that sort of thing. Anyway, I’m happy that I seem to have found the source of the text, as some others who have shared it have attributed it to Aaron Ansuini on twitter, so I replaced the black graphic with a screenshot, because if Aaron is the one who came up with this, they deserve the credit! Me: Welcome to my world, buddy! Demon: EVERYTHING HURTS, WHY?? AND WHATS WRONG WITH YOUR SHOULDER??? Demon: WHAT? *moves one arm, then the other* WHAT THE HELL? BOTH? Me: Left shoulder is because of broken collar bone from a beating from my Dad when I was ten. Me: Right shoulder was shattered in a bicycle crash when I was forty-one and should have known better. So that one is on me. Demon: *grabs a pencil* I NEED TO WRITE THIS DOWN… WHAT THE HELL? HOW DID YOUR WRIST DO THAT? AND WHY ARE SOME OF THE FINGERS NUMB? Demon: *moves fingers again* BONES SHOULDN’T DO THAT! Demon: WHY WOULDN’T DOCTORS TELL YOU THAT? Me: I mean, I was 14 years old, probably in shock, and they gave me stuff for the pain. So maybe I missed some things. Fortunately I’m ambidextrous, though since most of the school desks weren’t built for lefties, I didn’t have much practice writing with my left hand before that, so my writing was even sloppier on that side. And then, of course, there was Mr. Stahlecker, the geography teacher. Demon: WHAT DID HE DO? Me: Yelled at me for doing my work with my left hand. Said my right hand wouldn’t heal if I didn’t use it. Maybe if the doctors had told me not to use it I could have told him. But he probably would have scoffed and given me more detention. I mean like he did when I told him it hurt to try to write with the right hand. Demon: DETENTION FOR BEING IN PAIN? Me: Well, he said it was for talking back. But, yeah, basically. He was a real piece of work. Kept a swear jar on his desk and made us put money in it if he thought he heard us mutter a dirty word? But he was also the assistant basketball coach, and he called us faggots any time any of us failed to do something during practice. Me: I’m kind of disappointed you don’t know all this. I mean, I always figured that the redneck American public school social environment had to be designed in Hell. Demon: DON’T TRY TO BLAME ME FOR THAT! Me: I suppose next you’re going to tell me that arthritis and gout aren’t plagues from Hell, either? Demon: OH, THAT’S JUST BIOLOGY! TECHNICALLY HEAVEN’S FAULT, SINCE THEY SET UP THE PARAMETERS OF CREATION AND… WAIT, SO THE ARTHRITIS IS WHY MOST OF THESE THINGS HURT? Me: Actually, going by the tests, I barely have any arthritis, yet. But, they say the damaged joints show it first, and it just gets worse everywhere over time. Demon: AND YOU HAVE GOUT, TOO? Me: Don’t worry, if you just remember to drink at least one glass of water every hour you’re awake, and take the little white pill each night, it’s almost never a problem. Demon: *reaches for the pill minder* WHICH PILL… WAIT, WHAT ARE ALL OF THESE FOR? Me: Oh, this and that… I can go over all of it if you want. Demon: AND DID YOU SAY A GLASS OF WATER EVERY HOUR? EVERY HOUR?? HOW AM I SUPPOSED TO WREAK EVIL ON THE WORLD IF I HAVE TO TRACK DOWN A GLASS OF WATER EVERY HOUR? Me: Don’t forget, you’re going to be needing to find a bathroom just about every hour, too. Demon: THAT’S INSANE! AND EVERYTIME I TRY TO DO ANYTHING *waves one arm wildly* OUCH! I HAVE TO PUT UP WITH THIS!? Me: You get used to it. Me: I have some dark chocolate squirreled away if that would make you feel better. Me: I was just offering. Demon: NO, I MEAN, I REFUSE THIS ASSIGNMENT! THIS ISN’T A POSSESSION, THIS IS UNSAFE WORKING CONDITIONS! THIS BODY IS A HOSTILE WORK ENVIRONMENT! I’M GOING TO GO FIND MY SHOP STEWARD AND LODGE A COMPLAINT WITH LOWER MANAGEMENT! Me: If that’s what you think is best! Me: Sorry it didn’t work out. 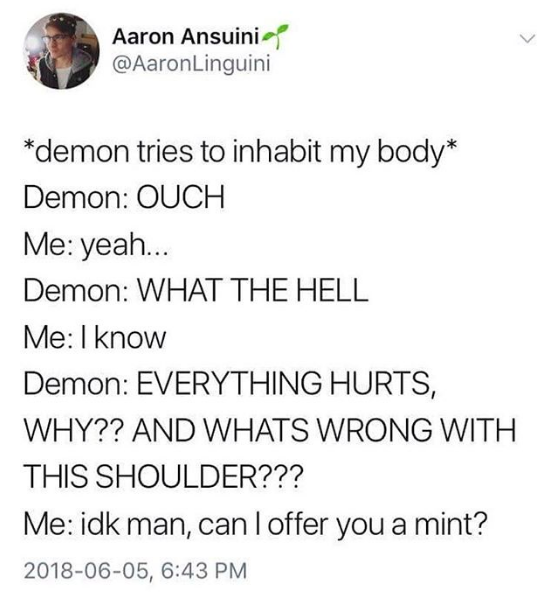 Demon: *pauses* WAIT, YOU SAID DARK CHOCOLATE? Me: Would you like some for the road? Demon: IT’S BEEN A WHILE SINCE I HAD ANY WHILE I WAS WEARING HUMAN TASTE BUDS, SO, YEAH… JUST ONE BITE. Demon: *eats chocolate, sighs appreciatively* I BETTER GO. Me: Good luck with the complaint!